When travelling by rail in Russia, are dining cars present? What quality of food would one expect on a train diner as compared to those one would find in Europe? I am especially keen to know if smoked fish from Lake Baikal might be available. Is there hot water for drinking in the 3rd class coach? Dining cars are present on almost every long-distance train. They offer rather good food (although I have little experience to compare it to European trains), though I would not expect much delicacies, just a good food of a middle-range city restaurant. Specifically for Baikal fish, I doubt it, except probably when you travel near Baikal itself. In addition to restaurant cars you can also buy basic snacks from a conductor at your car, and sometimes a waiter from a restaurant car would go through the train offering snacks to passengers. 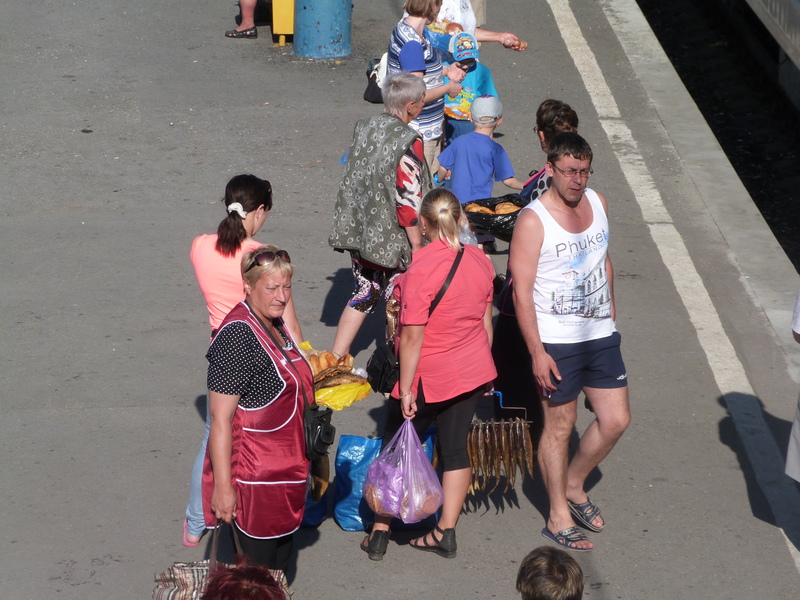 At the same time, as many have mentioned here, on every station where the train stops for at least 20 minutes1, there usually will be locals selling food to you right from the platform. The quality of that food varies a lot (with no medical control etc. ), but it is indeed a chance to try a good local food. I have never traveled near Baikal, but I've been once in Karelia, and a great choice of cooked (smoked etc.) fish was available. However, I think this might depend on a season. Apart from these local specialties, locals will be selling mostly basic food appealing for low-class travelers trying to eat as cheap as possible. Sometimes these locals will even buy a ticket from one station to a neighbor one and walk through train offering their products, so you might even not need to walk out. Also note that you can buy tickets with meals included, but this usually starts from 2nd class. On a short trip (1 night and shorter) this will be just several snacks and some drink, but on longer trains they can bring some basic hot food from the dining car directly to your compartment. When booking a ticket, look for label like "У2" in the carriage class field. "У" stands for "услуги" ("services" — meals, and also includes a few newspapers etc. ), while the number stands for the number of meals included. 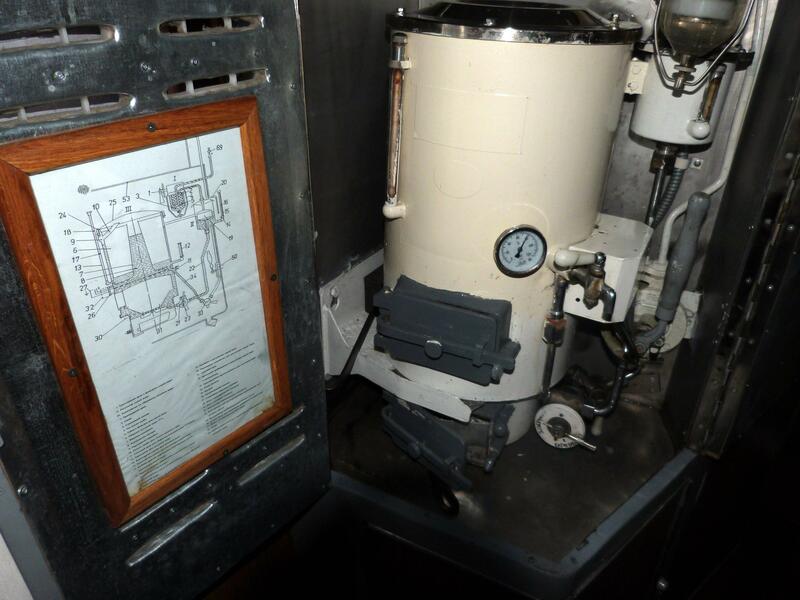 The boilers are available in every sleeping car, except for some exceptional circumstances such as boiler malfunctioning or running out of water. Not that these are unheard of, but rather rare, and most probable it will be OK to go to another carriage and use their boiler in such a case. The water quality might be not the best, and personally I dislike it and try to avoid, but many people do drink it. The biggest concern is not sanitary problems, but just some metallic smell etc. Also a bigger problem might be lack of cold (well, room-temperature) drinking water; you may find that boiling water is the only drinkable water you can get. It is a good idea to have a bottle or two of drinking water with you. Also note that there are different train types in Russia. The best are so-called "firmenny" trains (фирменный поезд), or the "premium" ("премиум") introduced several years ago. They have all the facilities (from restaurant cars to 3rd class carriages and toilets) much better than other trains, but the tickets are also more expensive for the same class. At the other end, during high season (summer) you might see temporary trains assigned for just a couple of months. They are usually compiled of different old carriages and may have many different problems; I even am not quite sure whether they have a dining car at all. A rough rule of thumb is the less is the official designated number of train/route (you see it when you book the tickets), the better is the train: trains from 1 to approx. 150 are firmenny trains, while those temporary trains are usually assigned numbers at about 800 and above. Intermediate numbers and trains also exist. 1 Such stations are usually every several hours of train trip. And yes, even if the train comes to the station in dead night, some locals still probably will be there. As shown, there are ample provisions with the most concern devoted to alcoholic beverages. But there's nearly every kind of food available for snacking and hot meals. The dining cars are well above UK standard and minimally equal to or superior to European standard. You can get to the dining car from 3rd class. On your specific question, about the smoked fish (presumably smoked Omul) from Lake Baikal... You would certainly be able to get it on trains originating in Irkutsk (Иркутск) and possibly trains on the route from Perm (Пермь) heading eastward (namely the Transsiberian). But I doubt that smoked fish from Lake Baikal would be available on other legs. There's also some seasonal variations because lots of the fishing villages on the lake are not accessible by road (plus ice on the lake is up to two meters thick in winter). I would be surprised to see it on trains serving western Russia. What this amalgamates to is my suggestion to 'stock up' in Irkutsk. Failing train availability, you would be able to get smoked Omul from Lake Baikal at the food section of GUM (ГУМ) in Moscow (assuming you are well-minted). For your other question about hot water, this is covered by regulation backed by long-standing convention. No problem. Here is a (blurry, sorry!) 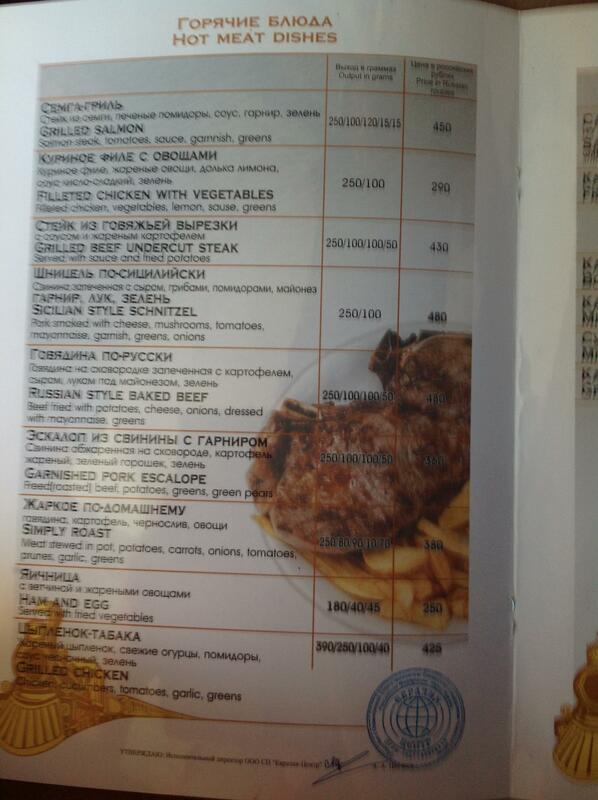 picture of the menu as I found it when travelling on the Trans-Siberian Railroad in 2013. Here are some further pictures of the specialties, pancakes, and appetizers. They have quite a respectable assortment, and I think they actually had most of it in stock (in contrast to the Chinese restaurant car, which was out of nearly everything and was closed most of the time). By Western standards the prices are quite reasonable (the salmon, for instance, is the equivalent of €6,50) and the quality is quite good. Almost everything seems to be prepared with dill and vinegar, though. 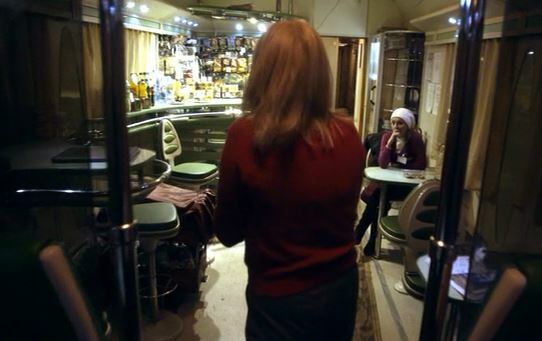 We found the restaurant car empty most of the time, and we were usually the only customers. You can also buy food from ladies on the platform, and since there are only a few stops per day, if it does stop, it stops for more than enough time to let you do business. The selection is very varied, ranging from fresh vegetabeles, snacks and candy bars, to smoked fish and savory pastries. And yes, they do have smoked fish. I'm not sure if this particular one is Omul from Lake Baikal, but it certainly did stink up the carriage like proper Omul would. It's a very good idea to bring some instant coffee, noodles or freeze-dried camping meals and cups and bowls to prepare said items. Anything you can add boiling water to works. In addition to other answer: Every long-distance train contain a car with restaurant in it, it's located in a middle of the train, and it works nearly 24-long, so you can try out the food there. Also there are always some snacks you can buy on the car-holder. As other's mentioned, on some stations you can find a local food, but be cautious with it as there is no control on them from medical and hygienic services. Am I right you are saying about Couchette class as the 3d class? If so, there always be a water cooler or boiler with hot water for you. It's for free, and must be all the way long your trip. My information is a bit outdated (1999 and 2000), but you can expect every carriage on long distance trains to have a samovar with boiling hot water available to you. As @michael-borgwardt points out, at plenty of stops outsiders will be selling food. And they will do so on the stops where they know there will be enough time for you to buy it. I also seem to recall that, on some trains, food is available on the trains, as well. But, my memory is a bit hazy on that. At nearly every stop, there are local people selling food to the travellers. Source: TV documentaries I've seen. I used to live in Russia. Yes, there is usually a restaurant car in the middle of long haul train. Yes, the water boilers is available in every single car, so you can get tea or coffee. But that is it. Answering your question, you should not expect any quality of food on the train or on any stops. Try to avoid it, you may then get a dissent vacation. If u stop over in some city/villages, ask locals, usually you can find some local shops with good quality of smoked fish. There is probably a drinking water on the train or you can buy it during stops, but common get 3-5 bottles before boarding to avoid surprises, especially if you are traveling with kids. Not the answer you're looking for? 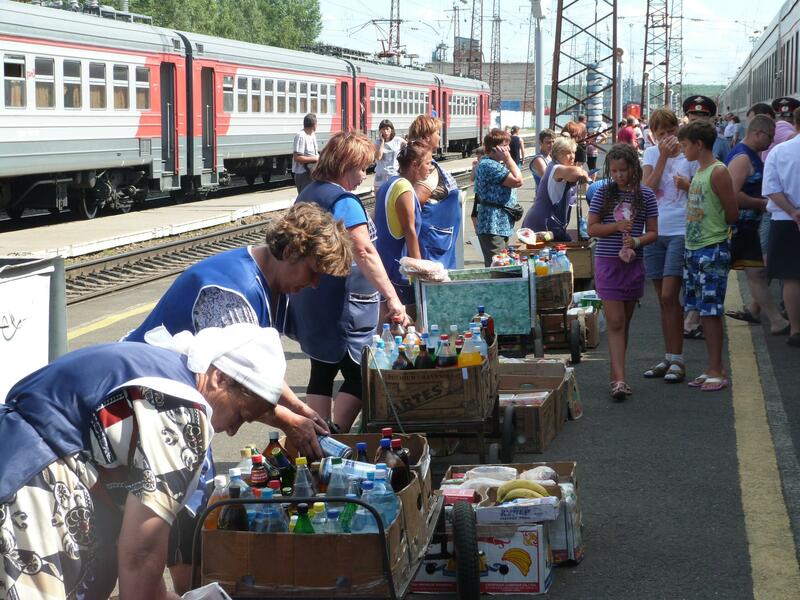 Browse other questions tagged trains food-and-drink russia siberia or ask your own question.